plus a flax kete, and all will be sweet! Poor Pete. His best mate is a pet parakeet. 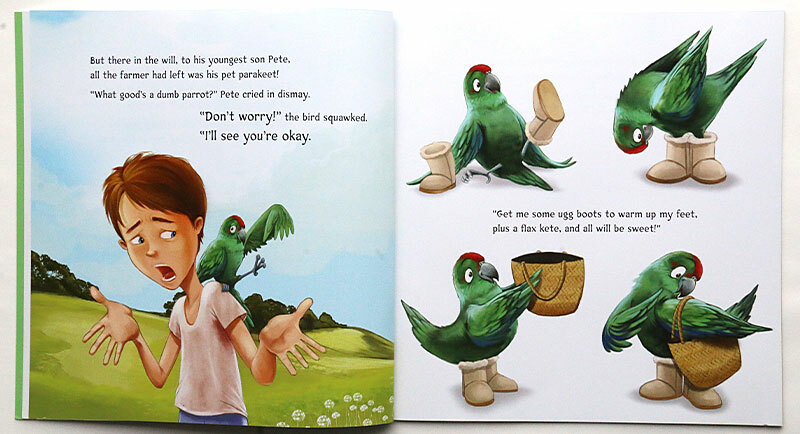 But that fine-feathered, fancy-footed fast-talker is no ordinary bird, and soon life is sweet for Pete! Based on Puss in Boots, the Parakeet in boots does much the same sort of thing. He helps his friend Pete trick the Big Boss into thinking he is the Pongatown mayor, who is rich and impressive, in order to win the hand of his daughter. As it happens, Pete couldn't let the trickery go on and confessed to everything. But the Big Boss could see how his daughter looked at Pete and agreed to the marriage anyway, as well as retiring and giving Pete his business. 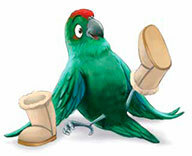 Australia and New Zealand both claim to be the original home of ugg boots! For decades, local traders used the name 'ugg' to describe their product, - which legend has it – dates back to the days when shearers wrapped sheepskin around their feet to keep warm. Sheepskin boots have long been popular with people in rural occupations, such as shearing, who have ready access to the raw materials. The boots became popular in the 1960s, when surfers began using them to keep their legs warm while out of the water. Ugg boots marched back into fashion during the past decade. Now everyone seems to be sporting the boots, including Hollywood celebrities. I wrote a version of this story quite a few years before Parakeet in Boots was published. The original version was called "Bug in Uggs" and starred a Huhu bug as the "Puss in Boots". Needless to say, this was stretching the imagination a little too much for the publishers, so it was rejected. 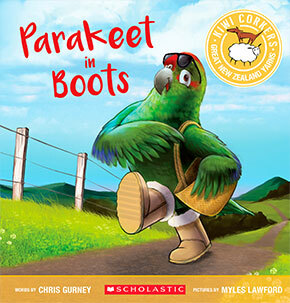 Five years later I hauled the uggs out of my filing cabinet and put them on handsome Parakeet's wee feet, and suddenly the story worked and transformed into a book. This book had the shortest 'brewing' time I've ever experienced with the books I've had published. I wrote the story in February 2016, had it accepted in March and it was on the retail bookshelves in November. 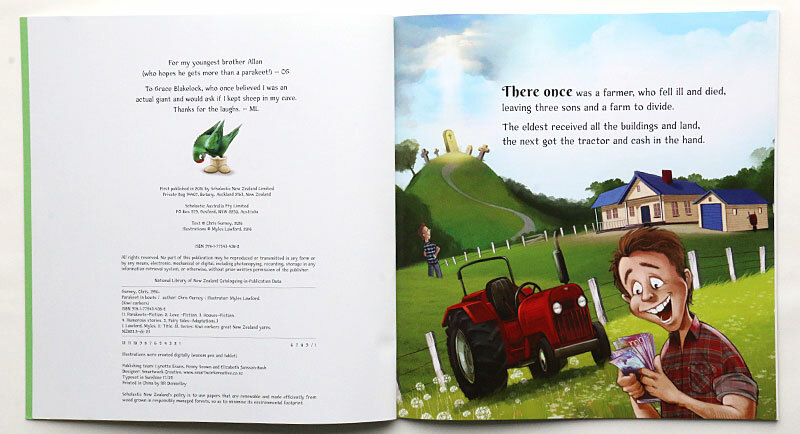 This was because Scholastic was actively looking for another Kiwi Corker to follow up the previous popular story "The Three Cattle Dog's Gruff". Kakariki feed on berries, seeds, fruit and insects. It is not unusual to see Kakariki searching for food on the ground. Kakariki translates as "small parrot" in Maori. "Kaka" means parrot, and "riki" means small. Kakariki are usually solitary or found in pairs, although in autumn and winter they may form small flocks. In flight they make a loud rapid chatter that sounds like 'ki-ki-ki-ki'. Watch a short video of the Parakeet, or Kakariki. What is a herringbone milking shed? Both dairy farming and sheep farming play a big part in New Zealand’s economy. Find out more facts about sheep farming in NZ. Who brought the first sheep to New Zealand? 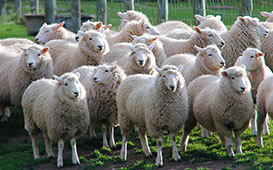 What was the first breed of sheep brought to New Zealand in large numbers? Print this template and make a face mask of Parakeet. Print this maze and help Parakeet find his way back to his nest. 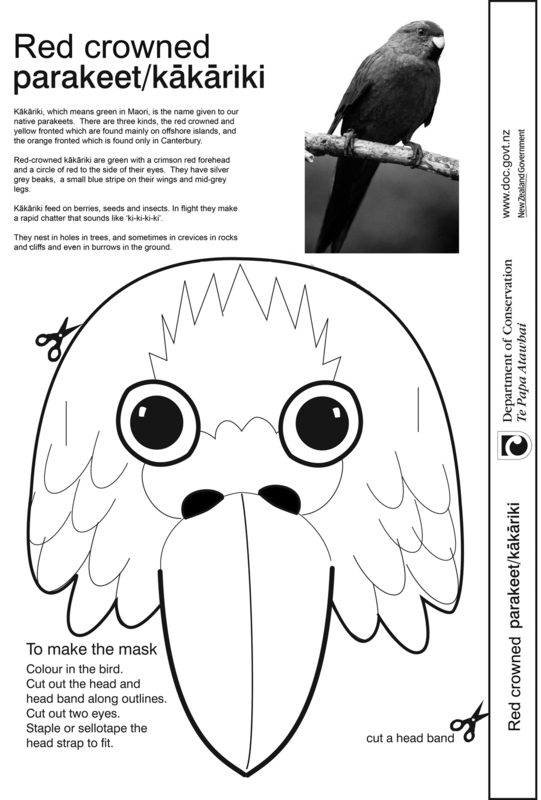 Print this colouring sheet, and colour in Parakeet's beautiful feathers.